Whether it’s hiking or horseback riding, biking or busing, there are plenty of ways to explore the well-heeled neighborhood of Hollywood Hills. Its famous bright white Hollywood sign has become an iconic California image and its panoramic views of downtown Los Angeles, Hollywood and the San Fernando Valley have made it worth venturing outside the city for tourists hoping to capture the perfect sunset picture. Travelers can climb to the top of Mt. Hollywood or wander through scenic Griffith Park. John Anson Ford Theater, the Hollywood Bowl, the Hollywood Reservoir and Forest Lawn Memorial Park are also popular sites on a visit to this famed high-rent neighborhood, but visitors would do just as well to drive around the quiet streets taking in some of the most classic (and impressive) residential architecture in California. Hollywood Hills is part of the Santa Monica Mountains. The neighborhood borders Studio City, Burbank, Griffith Park, Los Feliz, and Universal City. Explore Hollywood and Beverly Hills on a 2-hour small-group sightseeing tour that travels through Los Angeles by open-top van. Your guide shows you filming locations and celebrity homes around the city, along with iconic locales like the Hollywood sign, the Hollywood Walk of Fame, and Mulholland Drive. Check out places where TV and movies like 'Back To The Future,' 'This is Us,' and 'Iron Man' were filmed, and hear live commentary from your guide about LA's history, architecture, politics, art, and music. Los Angeles is a sprawling city that's best to explore by car, but if you drive yourself, you're bound to hit that infamous LA traffic. Avoid the hassle with this private SUV tour of Hollywood and Beverly Hills—two neighborhoods packed with LA's best attractions. After meeting your driver, you're whisked through world-famous streets—like Melrose Avenue and Rodeo Drive—and into the Hollywood Hills. Snap a selfie with this iconic Hollywood Sign, and check out the stars on the Walk of Fame. Get an insider glimpse into the lifestyles of the rich and famous on this customizable, VIP tour. Skip the crowded coach and hop a sleek, luxury SUV, equipped with WIFI, free snacks, and bottled water. You’ll cruise filming locations and gated mansions in the Hollywood Hills, Beverly Hills, Holmby Hills, and Bel Air, getting a first-hand peek at the region’s most legendary real estate. Experience Southern California’s storied city on a heart-pumping hike to Mt. Hollywood’s summit. Embark from the historic Wattles Estate, cruise by a hidden Buddhist garden, and check out a few celebrity homes—all while learning Hollywood’s legendary history from an informative guide. Capture memorable photos at the Hollywood sign and grab breakfast near the Walk of Fame afterwards. Layovers can be frustrating, especially when they’re long and the city’s right out there waiting for you to explore. 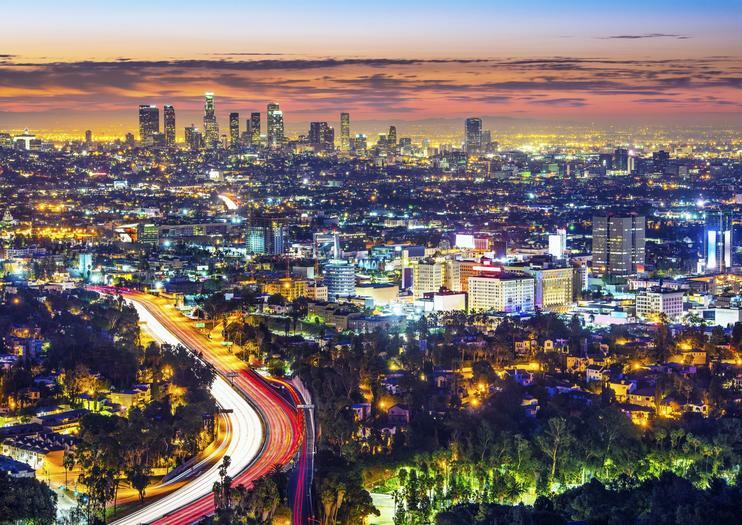 Instead of spending the day milling around LAX, then, head out into the city and enjoy a few hours experiencing the glitz and glamour of Los Angeles’ Hollywood and Beverly Hills neighborhoods. Visit LA’s famous landmarks, including the Hollywood sign, in your private SUV. Unlike the city’s prolific sightseeing buses, though, this tour isn’t all drive-bys – there’s plenty of opportunities for photo stops. Movie enthusiasts experience the glamour of old Hollywood on this half-day sightseeing tour celebrating the movie industry's golden age. Enjoy the must-see sights in Beverly Hills and Hollywood, and learn about the stars and studios that brought the joy of Hollywood movies to the world. On your tour, pass the original film studios, see historic celebrity estates, and stop for a photo op in front of the Paramount Studio gates. Explore Hollywood, Los Angeles, and beyond on this half-day guided excursion. After a convenient pickup from select hotels, head out with a knowledgeable guide and experience classic sites like Chinese Theater, the Hollywood Walk of Fame, the Los Angeles County Museum of Art, Rodeo Drive, Sunset Plaza, and Melrose Avenue. Have you ever wanted to travel in a convertible Mustang on Beverly Hills' most luxurious streets? Are you curious to know what celebrities' houses and their neighbourhoods look like? Have you ever wanted to learn interesting facts about Los Angeles? If so, then this is the tour for you! Travel in luxury and comfort with VIP Mustang Tours that take you to the popular places where your favourite celebrities live, work, eat, shop and socialize. Our -VIP Mustang Grand tour takes around 5 hours and is up to 3 people max. If you're short on time, and would like a wonderful perspective of the Hollywood, West Hollywood and Beverly Hills areas, this 2-hour private tour is perfect for you and your immediate party. You will travel in a black SUV with a knowledgable and personable guide that's passionate about showcasing the city. See why this tour is popular among the luxury community of 5-star local hotel concierges, as well as international and domestic travel agents. *In the tour details listed above, there are few options that best describe timeframes for stops and drive-by introductions. Plus, there are a handful of locations not listed in available "Attractions." Some attractions may not be accessible on certain days of the year. This tour is a solid 2 hours, and we've laid out a guesstimate on stops and travel time. Remember, this is a private tour, so you're also welcome to fully customize your time. If you want to see it all during your visit to Los Angeles, this private and fully customizable 7-hour full day tour is the perfect opportunity. On the city-side, see Hollywood, West Hollywood and Beverly Hills. Then travel west to take in the scenic beauty of Venice Beach, Santa Monica and Malibu. You're guaranteed a tried and true highly-rated industry professional guide that's fully licensed and passionate about showcasing our amazing cities. *In the tour details listed above, there are few options that best describe timeframes for stops and drive-by introductions. Plus, there are a handful of locations not listed in available "Attractions." Some attractions may not be accessible on certain days of the year. This tour is a solid 7 hours, and we've laid out a guesstimate on stops and travel time. Remember, this is a private tour, so you're also welcome to fully customize your time. Experience the seedy side of Hollywood and Beverly Hills on this guided excursion. After a convenient pickup from select hotels, head out with a knowledgeable guide and discover Tinseltown’s greatest scandals. Visit sites like Hollywood Forever Cemetery, Greystone Mansion and Park, the Sunset Strip, and Will Rogers Memorial Park. Enjoy complimentary Wi-Fi, bottled water, and a multimedia presentation. Whether you’re a film buff interested or you just want to explore Hollywood and some of its history, this private tour is a personalized and comfortable way to discover the stories of Tinseltown and the movers and shakers who made it what it is today. Learn about the birth of Hollywood as you drive by historic studios like Paramount, Desilu and Columbia Pictures, and learn about the industry today as you head into Burbank, home of Disney and Warner Bros.
Have you ever wanted to travel in a convertible Mustang on Beverly Hills' most luxurious streets? Are you curious to know what celebrities' houses and their neighbourhoods look like? Have you ever wanted to learn interesting facts about Los Angeles? If so, then this is the tour for you! Travel in luxury and comfort with VIP Mustang Tours that take you to the popular places where your favorite celebrities live, work, eat, shop and socialize. Our Premium VIP tour takes around 3 hours and is up to 3 people max. This unique private 4-hour Los Angeles real estate tour provides an invaluable service for anyone researching the Los Angeles area market. You'll have a dedicated, knowledgable guide provide you with a fantastic overview of the famous landmarks and sights around Hollywood and Beverly Hills. Also, you'll have a professional licensed real estate agent on board to answer questions about properties, different communities, and general terms related to the L.A. housing market.